For many robots, stairs are an insurmountable obstacle. But a young team from the ETH Zurich is building a vehicle that should overcome stairs easily – by jumping up them. 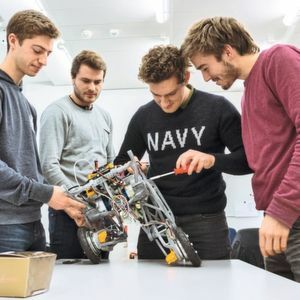 Ascento is the simple name of the sophisticated device built by eight machine construction students and one electrical engineering student at ETH Zurich. The robot can impress: it travels and balances on two wheels. Technically, this is much more difficult to realize than a vehicle on four wheels, but a so-called “bipedal robot” is more flexible and can adapt better to various types of terrain. But that’s not all: The main goal of the nine prospective engineers is to make the robot jump. Like a kangaroo, it is meant to jump upwards with a powerful push and land safely on its two wheels again. “This way, the robot can overcome stairs and other obstacles“, explains student Florian Weber. The Ascento team was formed during a focus project. Bachelor students from various faculties have the opportunity to apply their theoretical knowledge to a concrete project - from the idea to the functioning prototype. What is special about the Ascento is that this construction is practically an inverse pendulum. The centre of gravity is above the axis. Consequently, the Ascento can only stand and ride upright if it is powered and actively tries to maintain balance with the wheels. (Similar to how a standing person has to continuously use energy to maintain balance.) Thus, the Ascento can be compared with a Segway: here too, the vehicle is driven by two wheels on the same axle, and controlled drive technology is required to maintain balance. Possible fields of application for the Ascento include inspection robotics in buildings. For example, the vehicle could be sent into burning houses in buildings in danger of collapsing. A built-in camera then supplies the emergency services outside the building with valuable information. There are already several robots for such applications. "But especially when climbing stairs, many robots reach their limits," says Marcus Vierneisel, also a member of the focus group. The Ascento should be able to climb the stairs at a person's walking pace. Thanks to its light and two-wheel design, the Ascento is more agile than other robots anyway. "Larger robots can interact with the environment for this. Ascento cannot do this," adds mechanical engineering student Lionel Gulich. Instead, Ascento can quickly explore a building through its sensors and scan the rooms in 3D. Of course, the prototype will not yet be able to drive a whole house on its own. However, it should for example be able to approach a staircase in a remote-controlled manner and then use sensors to measure and calculate for itself which jump height and width are necessary to master the individual steps. "Initiating every single jump by remote control would be far too complicated and slow," Florian Weber points out. The Ascento thus falls into the category of semi-autonomous robots. Whether the focus project and the Ascento prototype will one day actually result in an inspection robot ready for series production remains open. However, this is not the first priority after all. A focus project serves the young ETH students primarily to venture into a concrete project instead of just studying theory. The prospective engineers receive both professional and financial support from drive specialist Maxon Motor as part of Maxon's Young Engineers Program (YEP). The Ascento is powered partly by two Maxon EC 90 flat motors. The torque of 963 mNm supplied by these motors is actually oversized for the robot to move on one level only. The engines bring their power into play when balancing the Ascento when landing on a narrow staircase, because this requires large and precisely controlled torques. The ETH students have opted for the frameless version of the motors. Here, rotor and stator are delivered separately and without drive shaft. Only when integrated into a system, rotor and stator are connected to each other. 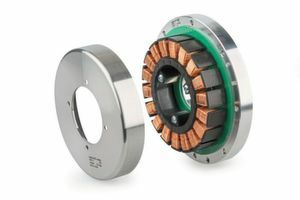 In robotics Maxon’s frameless motors are often the first choice because they save space and can be elegantly integrated in articulated structures. The two motors are each driven by a EPOS4 module.